Like any other animals, different species of wild birds can be affected by different diseases, if the necessary hygiene measures are not considered. If you have a large number of birds attracted to your garden, the best way to help them is to focus on prevention of the disease. Where does a disease come from? Many bird diseases are transmitted by droppings. If contaminated droppings of one bird get mixed with food, the other birds will be at risk of picking up that disease. Other species of animals (such as rats) can also contaminate birds’ food and that’s why it is important to guard against both sources of infection in your garden. What are the signs of disease? Although exact symptoms vary between diseases, and reaching a diagnosis requires veterinary input, but if you keep your eyes open to the following signs, you will be alert when an individual bird is suffering from some form of disease. Affected birds often appear lethargic and reluctant to move away from the feeding station. They may appear fluffed-up and show difficulty in swallowing food or water. They may also allow you to approach them and pick them up, something that a healthy bird would never do. Can wild birds be treated? Unfortunately, by the time it is possible to catch a sick bird for treatment, it is likely to be too late to help them. Treating sick birds without first capturing them is not advisable because there is no way of ensuring that medicines will be taken only by affected birds or in the correct doses. This means that it is far better to take preventative action to stop an outbreak occurring in the first place. Amount of food in your feeder is important. If the food you put in it takes days to clear, this means you should reduce the amount. Ideally, bird tables should be swept clean each day to remove droppings and any uneaten food. Location of the feeder can protect it from the reach of other animals such as rats. Hanging feeders or birdtables are preferable. Try to avoid putting the food directly on the ground. Avoid placing a bird table under a tree in which birds perch or roost, since it soon becomes heavily contaminated with droppings. 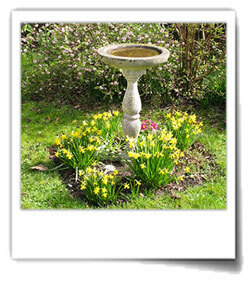 Keep the bird feeder/table and surrounding area clean and free from droppings or mouldy food. Mouldy food can provide a breeding opportunity for microorganisms which may make the birds ill. The ground beneath feeders should be kept clean by regular sweeping and disinfected through the use of an appropriate disinfectant. You can move your feeding stations to a new area every month to prevent droppings accumulating underneath. Clean and wash your bird feeders regularly, ideally using a disinfectant solution (used at the manufacturers recommended concentration) followed by rinsing and air drying before being used again. Water Containers should be rinsed out every day, particularly during the warmer months. After washing, allow it to dry before filling in with fresh water again. Bird Baths need to get cleaned and washed thoroughly every now and then, to prevent microbial contamination or droppings accumulated there. Your Personal Hygiene is also important. Wash your bird feeders outside of your house and use utensils separate from the ones in your kitchen. Always wash your hands before and after handling bird feeders, sick or dead birds in your garden. The risk of disease transmission is related to the numbers of birds congregating together. One of the best things you can do is to use several feeding sites within your garden to divide the number of birds between the stations.